The power skip is executed by doing an explosive, exaggerated skip while emphasizing height rather than distance. Emphasize a big arm swing and explosive knee lift. Purpose: To stretch the triceps, upper back, abdominals, and obliques. 1. 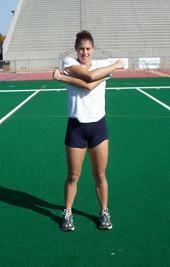 Bend to one side while holding your opposite arm overhead, quickly reverse direction and stretch the other side. 2. This drill should be done in a controlled continuous fashion for 10 stretches on each side of your body. Swing your arms forward, so they cross, and swing them back as far as possible. This drill should be done in a controlled continuous fashion for 10 repetitions. Purpose: To stretch the hip flexors, abdominals, quads and shoulders. 1. Lie down in a prone position. 2. While keeping your chest in contact with the ground, cross one leg behind the other to the opposite side of your body. 3 .This drill should be done in a continuous manner. Purpose: To stretch the hip flexors, quads and calves. 1. Keeping your hips and knees bent with shoulders positioned over the balls of your feet. 2. For the first 10 yards utilize short choppy steps. 3. For the second 10 yards open up your stride and kick back. Purpose: To stretch the abductors, adductors, glutes, ankles and hips. 1. Stay on the balls of your feet with your hips in a low semi-squat position. 2. Begin the drill by twisting your hips and crossing one leg in front of the other, bring your trail leg through, and cross your lead leg behind the trail leg. 3. Your shoulders remain square through the entire drill. Purpose: To stretch the glutes, quads, low back and shoulders. 1. Execute proper running form; keep your elbows at 90° and drive your hands up to chin level and back to your rear pocket. 2. Stay on the balls of your feet, and drive your knees up as high as possible, and then down as quickly as possible. 1. Begin running by flexing your knee and bringing your heel back and around to your buttocks. 2. Maintain a slight forward lean throughout the drill, and stay on the balls of your feet. 3. Complete 20 kicks within 10 yards. * Maintain a quick, yet shallow arm swing, keep your elbows at 90° and drive your hands from chest to front hip pocket. Purpose: To stretch the groin, glutes, hamstrings, and ankles. 1. Keep your torso upright and take a long stride out to the side. 2. Lunge out bending your forward knee to 90°while keeping your trail leg straight. 3. Lower your hips and shift your body weight to the opposite leg. 4. Recover by bringing your feet together and standing upright. * Repeat the drill for 10 yards. * Keep your head focused forward with your arms hanging down in front of your body. Purpose: To stretch the hamstrings, calves and lower back. 1. Walk forward keeping your front leg straight. 2. Kick your leg up and touch your toes to the fingers of your opposite hand. 3. Repeat the cycle with your opposite leg. * Keep your arm extended out parallel with the ground. * On your first set of this drill only kick to 75% capacity, and then on your second set kick to full capacity. 1. Drive your forward knee up as high as possible and then step out with a long stride striking the heel of your forward foot and extending onto the toes of your back foot. 2. Complete the cycle by bringing your trail leg through and standing upright. * This drill is performed identical to the walking lunge, with the exception of the high knee action. * Position your hands behind your head with your eyes focused forward. * Flex your front knee to 90° and keep your back knee from striking the ground. 1. Step out with a long stride, striking the heel of your forward foot and extending onto the toes of your back foot. * Position your hands behind your head while keeping your eyes focused forward. Purpose: To flex the hips and shoulders, and stretch the glutes, quads, lower back and shoulders. 1. Take an exaggerated high step, driving your knee as high as possible, and simultaneously push up on the toes of your opposite foot. 2. Use the proper arm swing; 90° angle at the elbows, hands swing up to chin level and back beyond rear pocket. * Drive your knees up as high as possible. 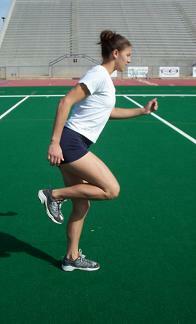 High knees pull: Same as above, but grab your knee and pull it up and in with each stride. 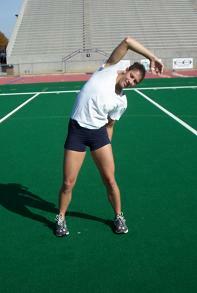 Below is the standard dynamic flexibility . Your workout should have a prescribed warm-up, but if it doesn't a three minute total body warm-up, (i.e., jogging, rope jumping, total body movement) should always precede this dynamic series. The warm-up raises the body temperature, increases blood flow to the muscles, and lubricates the joints. Always remember warm-up to stretch, do not stretch to warm-up. Dynamic movements are the best way to prepare your body for dynamic workouts. Contrary to old beliefs, the best time to work on static flexibility is at the end of your workout, and not in the beginning. After every workout you should follow a 4-6 minute total body static stretching series. The following series of Dynamic movements will develop your flexibility, balance, coordination, mobility and strength. Coach Werner and JMUStrength&Conditioning retains all Rights and Copyrights to this article and photos but has agreed to allow me to post them at the Barrie Spirit Soccer website free of charge. These are just a sample of his many excellent strength & conditioning articles which are available at the JMUStrength&Conditioning website.